Find hotel near Cascata Su Spistiddadroxi .. 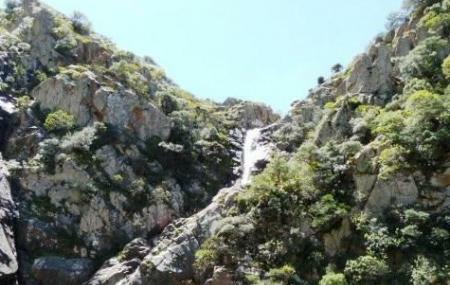 This gushing waterfall is a wonderful attraction in the Province of Cagliari. Although it is a small waterfall, it attracts plenty of locals and tourists who come here for an outing. The water falls in beautiful lake which is an ideal place for swimming and fishing. The lush green surroundings of the waterfall are enough to rejuvenate someone’s mind. There are some biking and hiking trails near the waterfall where many nature enthusiasts love to enjoy a walk or a ride with their companions. Explore Cascata Su Spistiddadroxiu and other prime spots of the city using Carbonia trip planner. Add accommodation and hotels in Carbonia that suit your budget including the most recommended ones like Panorama Hotel, Hotel Cala Di Seta and Hotel Le Sabbie. Find out how to reach Carbonia to begin with. Plenty of wholesome Carbonia vacation packages are available to choose from, pick your today! Love this? Explore the entire list of places to visit in Carbonia before you plan your trip. Fancy a good night's sleep after a tiring day? Check out where to stay in Carbonia and book an accommodation of your choice. Cascata molto bella, percorso per arrivarci dalla strada asfaltata un po' lungo, ma se si dispone di un fuoristrada o di una macchina alta, si può arrivare molto vicino, oppure con un bel trekking in mezzo alle montagne! Da visitare soprattutto in periodi molto piovosi per ammirare i suoi salti. Bella cascata caratterizza da un triplo salto e da un percorso non agevole per raggiungerla. La sua riservatezza la rende ancora più preziosa e indimenticabile.